Back to the Peeples Place at KHTS front page. Former “Two and a Half Men” star Charlie Sheen was shot on the historic Main Street Western set at Melody Ranch Motion Picture Studio in Newhall, Calif.’s oak-lined Placerita Canyon on May 17. 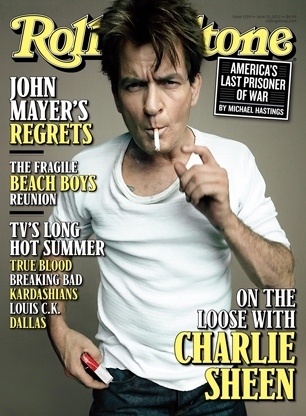 For the cover of Rolling Stone, that is. On the morning of May 17, Sheen, Sirotta and a small army of hair, makeup and stylist people and female models converged on the historic movie ranch, once owned by Gene Autry (who named it) and location for hundreds of films and television shows since the 1930s, from Westerns (“High Noon,” “Deadwood”) to war sagas (“Combat!,” “Red Dawn” — the latter co-starring a very young Charlie Sheen). The Rolling Stone story leads off with a double-truck photo of Sheen lying on his back atop of the old Western bars at the ranch, chugging a mini-bottle of Corona. Another photo of Sheen was shot on Melody Ranch’s Main Street, with the storied storefronts in the background. Andre and Renaud Veluzat walk Main Street at Melody Ranch in spring 2010, just before the set was “dressed” for the annual Santa Clarita Cowboy Festival, which the Veuzats host. Photo: Stephen K. Peeples. “Charlie was up here the whole day and we shot this thing, and it was way cool,” said Renaud Veluzat, who co-owns the ranch with his brother Andre. “I hadn’t seen him in 30 years and he pointed that out. Andre and I furnished all the military vehicles and stuff for that movie ‘Red Dawn,’ and he flashed back to that,” Renaud said. “He said it was 30 years since he did that show, and it was the second movie he ever worked on. He was 17 years old. So it was pretty cool to talk to him again after all these years. And the photo shoot came out real good. What was Charlie like to work with on this shoot? Here’s a preview from Rolling Stone. Return to the Peeples Place at KHTS front page. In addition to his “Peeples Place at KHTS” blog, Stephen K. Peeples is a writer/reporter for KHTS News (www.hometownstation.com) and SCVNews.com, and host, writer and co-producer of the weekly “House Blend” music and interview television show on SCVTV, community television for the Santa Clarita Valley (www.scvhouseblend.com). A former SCV music/entertainment columnist for The Signal newspaper and website (2004-2011), Peeples is a Grammy-nominated record producer (“Monterey International Pop Festival,” MIPF/Rhino, 1992), an award-winning radio producer (“The Lost Lennon Tapes,” Westwood One, 1988-1990) and an award-winning online editor (The Signal website, 2007-2011). For more information, email skp@stephenkpeeples.com or visit www.stephenkpeeples.com.